A bill that would supercharge Minnesota's renewable energy standard got its first hearing at the state Capitol Tuesday. It would require utilities to provide 100 percent clean electricity by 2050. Minnesota has met its renewable energy goal — requiring utilities to get at least 25 percent of their energy from renewable sources by 2025 — seven years early, but advocates say the state needs to accelerate those efforts to avoid the worst effects of climate change. The original goal had bipartisan support and set goals for reducing the greenhouse gas emissions that contribute to climate change. Sen. Nick Frentz, DFL-North Mankato, recalled Tuesday that there were plenty of doubters back then. "People said, 'You can't do that, it's going to increase the price of electricity,'" he said. "You're going to cost us jobs." But Minnesota's electricity costs have remained in check, and wind and solar expansion have created thousands of jobs in a state that has no coal to mine and no natural gas to drill for. And since that standard was put in place, the debate over whether climate change is real is no longer a question. "That ship has sailed," Frentz said. "The people of this state and this country are going to ask very soon: 'What did we do about climate change?'" Frentz is sponsoring the state Senate version of the total renewable energy bill. Sen. Karin Housley, R-St. Mary's Point, has signed on as a co-sponsor. Frentz said he has yet to get a promise for a hearing in the Republican-controlled state Senate, but dozens of people testified for and against the House version of the bill in the first of a two-part hearing before the House Energy and Climate Finance and Policy Division Tuesday morning. • Video: How is Minnesota doing with renewable energy? Rep. Jamie Long, DFL-Minneapolis, the bill's sponsor, cited a study released in August that shows Minnesota can meet its greenhouse gas reduction goals by electrifying transportation and heating — and transitioning to even more clean energy. "One-hundred-percent clean energy is achievable," Long said Tuesday. The state has made good progress on renewables, but while the costs of wind and solar energy have come down to the point that they are often cheaper than coal and natural gas, Long said that more stringent state policies are needed to move forward with urgency. "Business as usual and relying on markets is not going to get the job done in time," he said. "The crisis is urgent, and limiting warming by even a half degree would have huge benefits." Some GOP lawmakers Tuesday said the proposed bill doesn't have their support. 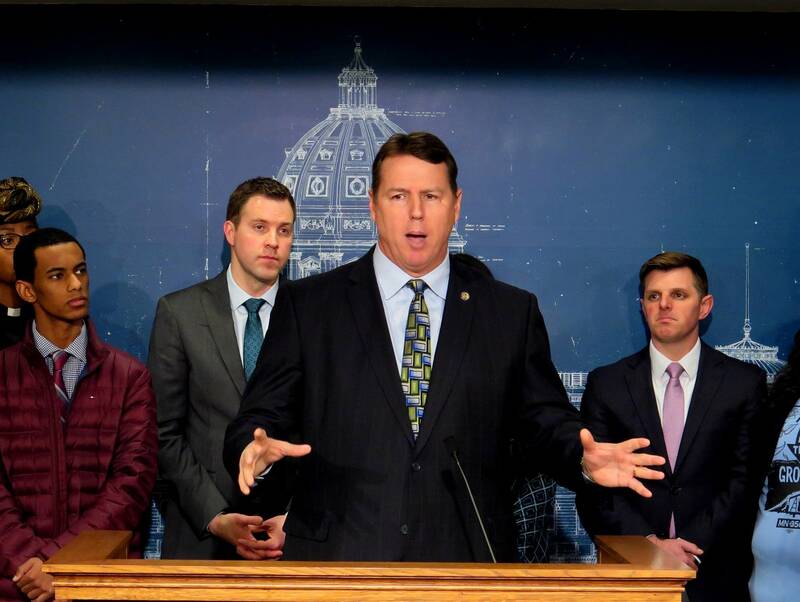 "Everybody shares the same goals of lower energy costs, reduced pollution and more jobs in Minnesota, but this bill doesn't do that," said Rep. Pat Garofalo, R-Farmington, a member of the House climate and energy committee. Garofalo said he's concerned that the legislation would increase energy prices. He would instead like to see Minnesota reduce carbon emissions and increase renewable energy in other ways, such as providing incentives for electric vehicles. Long's bill, he said, doesn't address the question of nuclear power, which he said Minnesota can't take for granted. "The most important thing we can do to reduce emissions is to make sure our nuclear power plants are kept open," he said. "These have been safely operating since the early 1970s, and shutting these down will have a huge increase on Minnesota's pollution profile, as well as greenhouse gas emissions." The operating licenses for two of Minnesota's three nuclear power plants, both run by Xcel Energy, are set to expire in the 2030s. The renewable energy bill doesn't outline how they might factor in to utilities' renewable energy profiles. But Kathleen Doran-Norton, a retired supervisor of Bridgewater Township in southeast Minnesota, said the effects of climate change are visible and urgent — down to the road maintenance needed to prevent flooding. She can even see it in Bridgewater, "standing at the bottom of a road ditch and looking at a twisted culvert that should have had another 15 years of life," she said. She hopes a transition to renewable energy will help avoid the worst effects of climate change. "For small communities," she said, "climate change is financial death by a thousand costs." 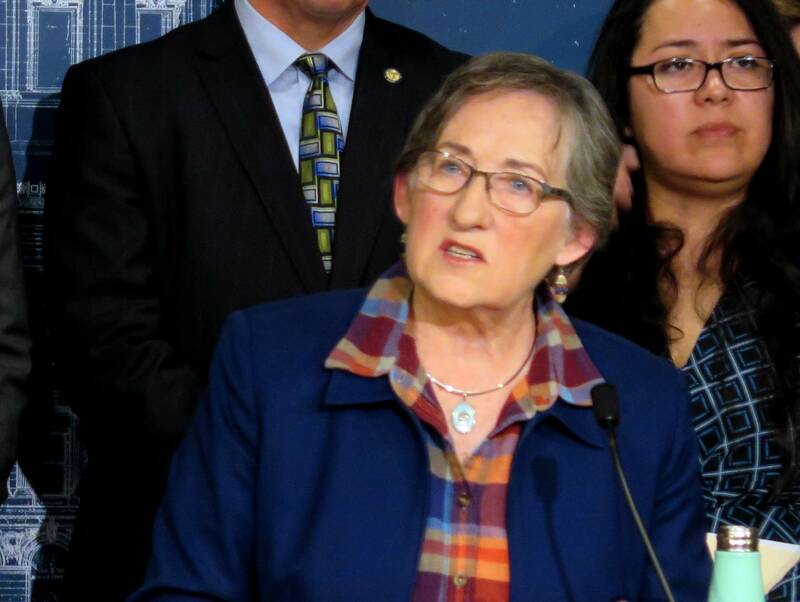 Doran-Norton joined a coalition of faith leaders, youth activists and environmentalists for a news conference after the first half of the two-part hearing at the Capitol Tuesday. They said they want to see Minnesota boost its renewable energy standard. And many focused on climate change's impact on future generations. Sheila Lamb, a mother and volunteer for climate activist group MN350, talked about the ways climate change has forced her to worry differently about her children's future. "I've spent years worried about broken bones, children falling off bikes and skinned knees," she said. "Our conversations, sadly, have changed to the point of anxiety and depression in our youth because they don't know what the future has to hold for them." 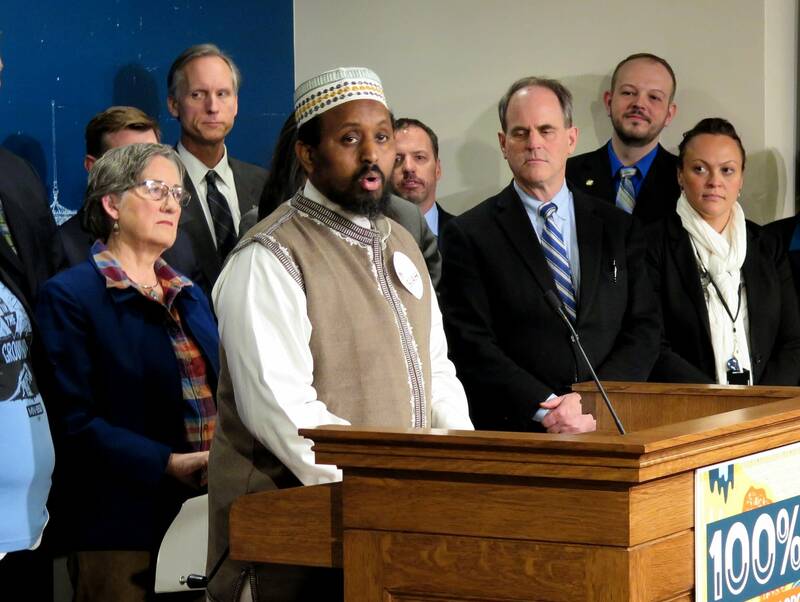 Mohamed Omar, executive director of the Dar Al-Farooq Islamic Center in Bloomington, said climate change is affecting his loved ones in both Somalia and Minnesota. "We have a once-in-a-generation opportunity to ensure the well-being of those we love today and to secure the future for our children and grandchildren," he said. Lawmakers who agree with the sentiment say they're working to gain traction on climate change in the Senate and will consider a compromise if there's not enough support for 100 percent clean energy.